Al Majid Motors, the sole distributor of Kia cars in the UAE, is seeing 12 per cent more customers booking test drives, after the recently concluded UAE road show. The tour, which travelled around the country, visited four major malls in three emirates, said a statement. “The ‘Kia on Tour’ Road show allowed us to bring our range of Kia vehicles to the people while they were undertaking their weekly shopping, as opposed to them having to make a special trip to an out-of-town showroom,” said Mohammed Khader, president. “The tour was a great success, with a registered increase of 12 per cent of people booking a follow-up test drive over the same activity last year. Customers were particularly interested in our latest offerings, the Cadenza, and the Cerato, which came onto the market in May,” he added. 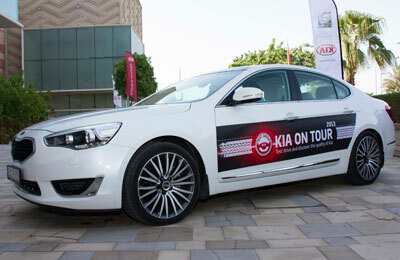 The annual month-long ‘Kia on Tour’ visited Festival City and Ibn Battuta Mall in Dubai, Bawadi Mall in Al Ain and Al Qasaba in Sharjah.